Breaking Down Barriers to Education! One of the things we are most passionate about here at Roots Ethiopia is identifying and removing the barriers between all rural kids and a good education. Some of those barriers involve financial means or distance from a school or adequate seating in a classroom or the availability of books. And sometimes the barrier is a pair of eyeglasses. Yesterday a volunteer team of Ethiopian vision professionals visited the school children we work with in Halaba. This is especially important for the 30+ children in our special needs program in Halaba. Children with Down Syndrome have a higher rate of vision impairment, and our plan is to serve their vision needs as fully as we can. 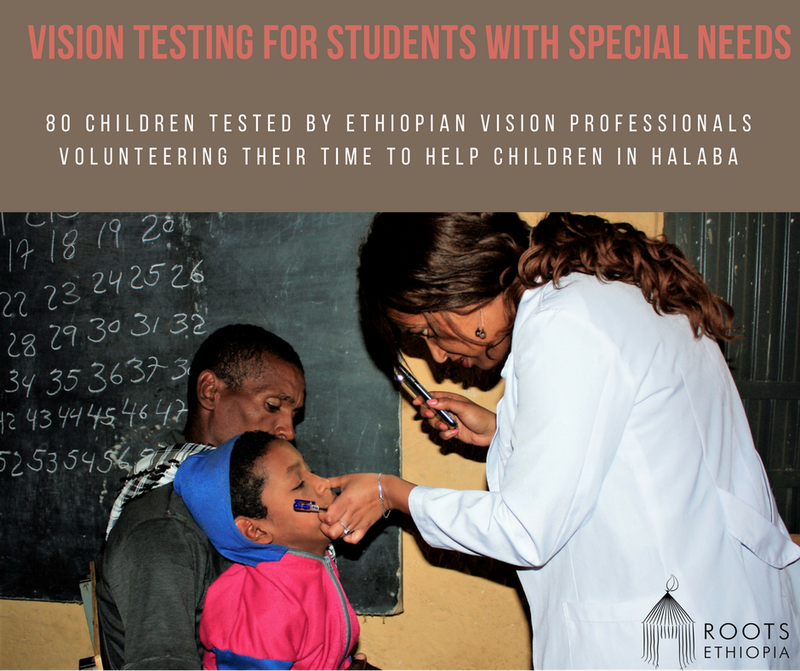 We love that over 80 students and their families were included in vision testing. We planned to evaluate 40 special needs students, but word got out and our team of volunteers worked as long as daylight allowed. We love knowing that so many kids saw themselves in the men and women who tested their eyes — representation matters! Maybe there is an ophthalmologist in the crew of kids tested! We are especially grateful for the kindness and generosity of the volunteers! The children benefited from their time, their skills, and their compassionate care. What a difference this will make! Next step: providing proper eyeglasses for these students. Stay tuned for more details! Next Next post: School Sponsorship Supplies the School Supplies!